We regret that you were not satisfied with your product purchase. If you continue to have questions or concerns please email us at customersupport@empiretoday.com. Please do not associated yourself with this company. 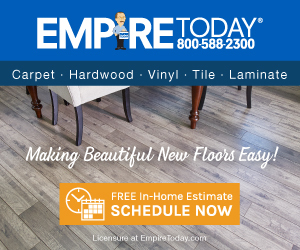 I purchased high grade carpeting from Empire in 2013 with the highest grade of padding they offered. In 2015 I noticed rolls in the carpeting in every room. It appears that the installers did not properly stretch the carpeting nor the padding. I regret wasting my hard earned dollars for their shoddy materials and installation. They say they have reasonable prices with good quality flooring..believe me, this isn't true by a long shot. Now I have to redo carpeting for each room. If you want good quality, shop elsewhere. I give Empire a 0 rating. Review #884096 is a subjective opinion of User884096. Thank you for bringing your concerns to our attention. We regret that your product is not meeting your expectations. We would like to help make things right for you, but unfortunately, we cannot locate your account with the information posted here. Please send your contact information to customersupport@empiretoday.com so that we can follow up with you.